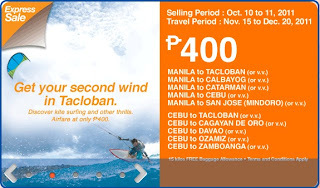 Home Cebu Pacific Promo Get your second wind in Tacloban! 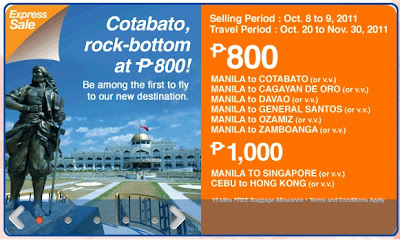 The latest flight route to Cotabato is here! Airphil Express gives you the Php800 flights from Manila to Cotabato, Cagayan de Oro, Davao, General Santos, Ozamis and Zamboanga. Only Php1000 to Singapore from Manila and Cebu to Hong Kong. 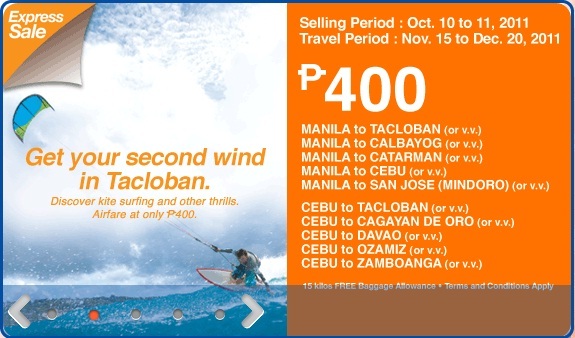 Have you been putting off that kite surfing at Tacloban for weeks now? Then now is the time to book that flight! Airphil Express will get you there at Php400! Same rate goes to flights from Manila to Calbayog, Catarman, Cebu and San Jose. Also for Cebu to Tacloban, Cagayan de Oro, Davao, Ozamiz and Zamboanga! Selling period is today til October 11 or until seats lasts. Also they provide you 15kilos of FREE baggage allowance! Yes, you get that for free! How many boxes of pasalabung can you bring home with that? !